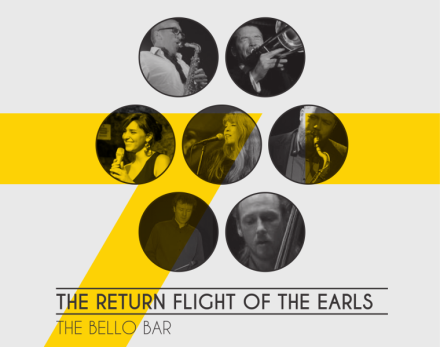 The Return Flight of the Earls celebrates Irish jazz musicians living and working abroad. Eight Irish performers return from France, Spain, Germany, England and the USA. They will bring many aspects of their life abroad to this grand reunion. There will be new compositions for the occasion, new groups formed and some new musical friendships. The returning earls of jazz are Michael Coady (Barcelona), Anthony Kerr (London), Matthew Halpin (Cologne), David Mason (New York), Gerard Murphy (Marseille), Fintan O'Neill (New York), Paddy Sherlock (Paris) and Christine Tobin (London and New York). There are two honorary Earls. These are Veronika Morscher (Cologne) and Phil Robson (London and New York). These musicians will be joined by eighteen musicians that live and work in Ireland, forming groups in a joyous celebration of "The Return Flight of the Earls".